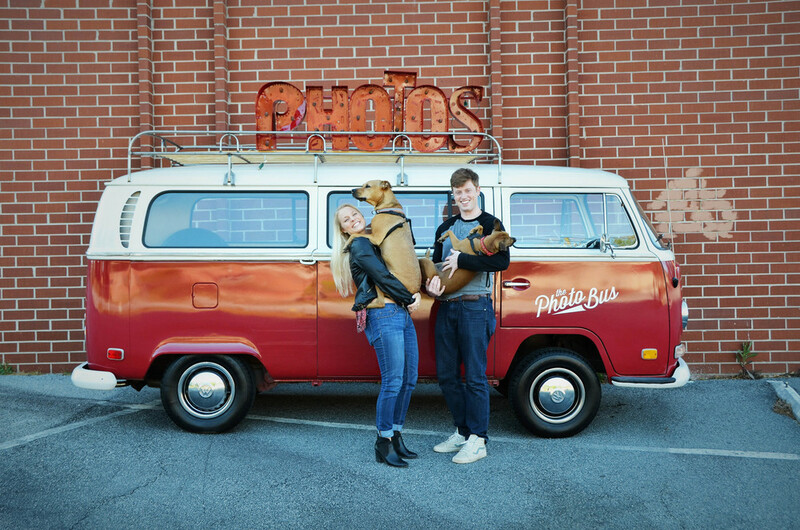 The Photo Bus ATL is a Vintage VW Bus Photo Booth. You have found the most unique and fun photo booth in Atlanta! The Photo Bus ATL is a high quality mobile photobooth that we have custom installed in the back of our vintage VW Bus. Lovingly restored and cared for, our 1971 VW Deluxe Transporter is loved by brides & grooms, guests, and visitors of all kinds of events. The standard wedding Photo Booth is played out. Have the Photo Bus ATL at your events for a truly unique experience for your family and guests. Hiring the The Photo Bus ATL is a great way to promote your brand and is a great activity for your employees and guests. The prints will be customized with your brand and website and we can even brand the bus. Want to make sure you throw the party of the year? Hire The Photo Bus for your next birthday bash, baby shower, anniversary, graduation celebration, bar/bat mitzvah, or holiday party. Let your guests go wild with creativity inside #thebestphotoboothever. Make your event special. Our Vintage VW photo booth is the coolest thing to happen to Photobooths in Atlanta! We provide a selection of different fun backgrounds for all of our photo booths and handmade props that encourage your guests to be creative and fun! All of our images go up on Facebook in addition the prints we hand out at events. You will also receive all the photos that are taken. We know how much you love your furry friends so we welcome them with open arms in our booth. Pets of all colors, sizes and kinds are allowed to have fun too! Woof! The Photo Bus business started with Professional Wedding Photographers so our photo booth uses only the best equipment. Professional ring-flashes, Nikon DSLR bodies, and Nikkor lenses. The files are delivered to you at 12mp size. Our staff always has a smile on their face. They will interact and guide your guests on how to operate the photo booth and answer any questions they have about our Bus. Our bus is a red 1971 VW Deluxe Walk Through. A few minor upgrades have kept her running strong for 47 years and counting! We have worked with the best in the business to strike a balance between classic original VW elements and upgrades to make our bus comfortable, modern and reliable. We pioneered the original ring light powered high quality photobooth in 2007. We asked, whats next? Every wedding and event in the past 5 years has had a photobooth. The Photo Bus ATL was our answer to take the photo booth to the next level. Check out The Photo Bus ATL out on the town. Join us for one of our public events, or book us for your next private event. Follow us around Atlanta on our Instagram account.